1 inch wide aluminum strip,thin aluminum strips uses many, such as aluminous model multiple tube, cable, optical cable, transformer, heater, blinds, etc. 3004 aluminum strip, plate, stretch pipe. Extruded tube can be used as long as the whole aluminum cans tanks, demanded higher than 3003 alloy strip, chemical products production and storage equipment, plate processing, construction, cable pipes, sewer pipes, all kinds of spare parts of lamps and lanterns. 3003 board. Strip. The foil. Thick plate, stretch pipe. Extruded tube. Type. Great. Wire rod. Cold working steel bars, cold wire, rivet wire, forgings, foil, heat sink material is mainly used for processing need good formability, high corrosion resistance, or solderability good parts, or requires both these performance need to 1 * * * series alloy high strength artifacts, such as the transportation of liquid tank and tank, pressure tank, storage device, heat exchanger, chemical equipment, aircraft fuel tank, oil pipe, reflector, kitchen equipment, washing cylinder, rivet and soldering wire. We offer an ample assortment of 1 inch wide aluminum strips, which are widely appreciated for their high tensile strength and unmatched quality. We are widely well reckoned as one of the preeminent thin Aluminum Strips manufacturers and suppliers based in china. 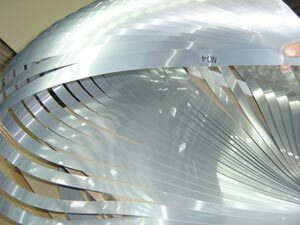 Our Aluminum Strips is easily available in various thickness, sizes and width.